Wow! So beautiful! I LOVE "Arshy" and "Germen Design". Looks gorgeous! All gorgeous of course, but especially love the designers outfit best...er, i guess i can see myself wearing that..and the outfit the model to the left of her in the brown jacket..love that too..Thanks Jana! Are my eyes lying?! 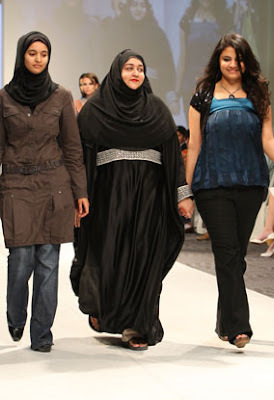 Do I see a fat model in a plus-size abaya? How wonderful!!!! We DO exist after all! !